At Pickering’s Auto Service, we have been servicing vehicles for Denver Area Residents for over 40 years. We keep up with state of the art vehicles built today, and never let go of our strong knowledge in older models. 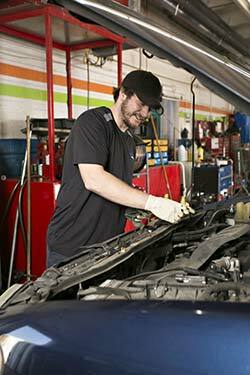 Our immaculate shop is clean, professional and ready to safely service your automobile. Hybrids are a newer technology that gives you more fuel efficiency and less harmful emissions. Hybrid vehicles use a battery and gasoline to power the electric and internal combustion motors to propel a vehicle. It may use both depending on the type of driving you are doing at any given moment. There are times that the electric motor runs alone, like while driving in town and low speed driving, then when in need of power to accelerate or at higher rates of speed they both activate to power the vehicle. The hybrid battery pack is the fuel source for the vehicle that drives the electric motor. It has to be recharged just like any other battery and over time the cells in the battery will degrade and ultimately the hybrid battery will need to be replaced. We are equipped with the tools and safety equipment to replace the hybrid battery on most vehicles. This work is dangerous as the vehicle can store high voltage in components that are capable of deadly electric shock. We strongly suggest not to try and repair or replace any electrical components on the hybrid vehicles yourself and recommend to bring it to professionals. We are also able to properly inspect and test for failures and in some cases there are repairs that can be made to resolve the customers complaint without replacement of the hybrid battery. The replacement of a hybrid battery is expensive and we want to make sure it is failed before replacing it, typically at a much more budget friendly price than many dealerships. Contact us for your hybrid service today! Keep Your Vehicle Reliable & Avoid Costly Repairs, Schedule Your Hybrid Service Or Contact Us TODAY! Avoid surprise hybrid failures or repairs with regular vehicle service. Pickering’s Auto Services’ ASE Certified expert Technicians are continually trained to help you maintain, repair, and service your engine to ensure the reliability and safety of your vehicle.